8-day tour to discover the cultural blending and cosmopolitan city of Kuala Lumpur and pamper yourself on the idyllic beaches in Penang. Petronas Twin skyscrapers in Kuala Lumpur, Malaysia, that are the world's tallest twin towers. 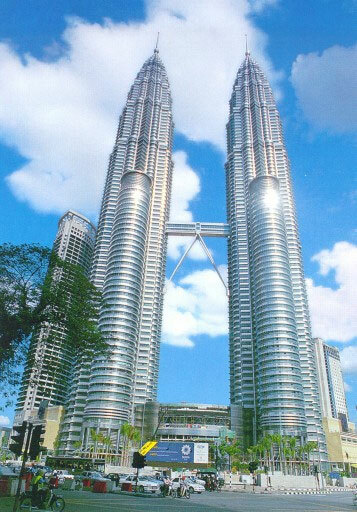 Standing 1,483 ft (452 m) high, they were designed by the Argentinian-American architect Cesar Pelli. Kuala Lumpur: City tour includes the King's Palace, National Museum, the National Monument, the Moorish-style railway station, a local handicraft center, the Independence Square and a photo stop at the Petronas Twin Towers. Penang: City tour features a visit to the Thai Buddhist Temple, which houses the 108-foot long reclining Buddha, and continue to the Royal Selangor Pewter Showroom for a frief demonstartion of pewter finishing. See the bustling waterfront with its "homes on stilts," dating back to the early Chinese immigrants. Other highlights include Khoo Kongsi, one of the most beautiful Chinses clan houses outside of China; a drive along the Street of Harmony; St. George's Church and a visit to the Penang Museum, which houses a collection of historical items. *Prices are in US dollar per person based on double occupancy departure from Los Angeles or San Francisco. Prices are subject to change, holiday/seasonal supplements, blackout dates, availability and restriction. Single room supplement and extra nights rate are available upon request. Prices do not include US departure taxes, fuel surcharge and PFCs of approximately $175-$225 per person.